The city of Ghent (Belgium) recently updated its 2003 Sustainable Urban Mobility Plan (SUMP). Thanks to continuous work throughout almost 30 years, Ghent has built up a thorough system of SUMP practice including monitoring and evaluation. As a reward, the city has been selected as one of the three finalists for the 2014 European SUMP Award. Ghent is an experienced city regarding sustainable urban mobility planning. The first bicycle and mobility plans date back from the Nineties. Nowadays, the municipality faces a rise in its population and an increase in the number of cars and of trips made in the city. To address these changes, Ghent wants its new SUMP to improve the accessibility, safety, sustainability and child-friendliness of the transport system and to contribute to make Ghent climate neutral by 2050. The co-operation with stakeholders is also at the very core of the revised version of Ghent SUMP. Among the expected results, the municipality wants to reach an ambitious modal split by 2030. 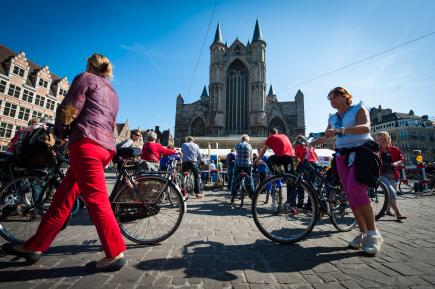 Ghent intends to increase walking from 14 to 18 per cent, cycling from 22 to 35 per cent, the public transport modal share from 9 to 20 per cent and to decrease car use from 55 to 27 per cent. With regards to the evaluation and the monitoring of the SUMP process, the city of Ghent has developed several tools. The ex-ante evaluation of the proposed measures has been made possible thanks to a traffic model built on data coming from a large-scale survey conducted in 2012 and data from other punctual activities. Moreover, Ghent also gained a solid experience in cost-benefit analysis in particular through its experience in the European programme CIVITAS. The city of Ghent will therefore use this knowledge to conduct a cost-benefit analysis of the SUMP as such and to assess different measures of the SUMP. Then, several tools will be used by the municipality for the evaluation of the implementation process. First, the city of Ghent had created a management tool called 'BBC' to monitor and evaluate the management and policy strategies. This tool, which is not designed specifically for SUMP-related activities, will be used at least once a year by the municipality and a more specific evaluation process will be undertaken on a more regular basis. In addition, a tool called GIPOD will be soon implemented to monitor road works. The municipality has also decided to involve stakeholders in the evaluation process. As part of this collaboration, links to evaluation tools of partners such as De Lijn or the Flemish government will be created. Through the ex-ante evaluation of the measures, the city of Ghent has identified some gaps in knowledge. When reviewing the data-collection process, the municipality realised that the surveys mostly focused on Ghent inhabitants and on vehicles. As a consequence, a lack of data on the mobility of visitors and on pedestrians has been identified. As a result, an investigation has been started to bridge the gap. As a result of the monitoring of the implementation phase, the municipality has already modified several proposed measures. In involving several stakeholders in the implementation of measures, the city of Ghent has received several useful opinions and taken them into account. For instance, one of the measures implemented was the closure of a street to motorised traffic. After a first implementation of the measure, it appears (through the feedback of involved stakeholders) that (un)loading parking spaces were missing in the street. Ghent has therefore modified this measure. It also allowed local stakeholders to be involved in the process. Likewise, the circulation scheme which has been chosen is very different from the first proposal. Feedback and comments from different stakeholders and partners of the city have been taken into account for this measure as well. Finally, the objective of the measure (implementing an efficient circulation scheme) has been met and opinions of the affected stakeholders have been respected. Finally, in the future, due to the fact that the SUMP will be monitored and evaluated on financial and substantive level, the city will have sound information on the effects of the different elements and actions of the SUMP on an early and regular basis. This will allow Ghent to adjust actions whenever needed, in order to reach the strategic goals as defined in the SUMP plan. The selection of the city of Ghent as one of the three finalists of the 2014 European SUMP Award proves that the evaluation and monitoring process as described in the SUMP is well-designed and that the municipality possesses good tools for the evaluation of sustainable urban mobility measures. However, some challenges has already been identified by Ghent. The city realised that very active citizens with high expectations would like to act themselves. This positive and strong-willed behaviour is as much an opportunity for the city as it is a challenge. A major challenge for Ghent is to embrace these dynamic residents and use them as a catalyser for the needed change in mobility behaviour. At the end of the process, the city of Ghent will share with peer cities and other stakeholders the lessons learnt from this new SUMP process, the same way it learnt from its own experience and from peer cities.